Add texture and style to your paper and cardstock projects with Darice's embossing folder! Use for scrapbooking, embellishing and much more. These folders fit most embossing machines. Each folder measures 5 x 7 inches. Shapeabilities Snowflake Toppers and Borders Etched Dies A Charming Christmas Collection by Becca Feeken is a set of six dies. Top and bottom of the outer border die is spit in half to create a shaped top or bottom to your card. The decorative inset pattern can be used to make a stunning inset accent. Nest all three to create a decorate border die cut. Approximate size: Rectangle Topper/Border: 5.00 x 1.25 in 12.70 x 3.20 cm, Rectangle Inset Design: 4.85 x 1.10 in 12.30 x 3.30 cm, Arched Topper/Border: 5.75 x 1.70 in 14.60 x 4.30 cm, Arched Inset Design: 5.60 x 1.55 in 14.20 x 3.90 cm. Christmas themed craft die featuring a Santa hat, a snowflake, and a Christmas Stocking. CottageCutz are thin metal dies. They are easy-to-use and add great detail to any craft project. Made in the USA. 100% lead free. Christmas themed craft die featuring a frame with snowflakes, Santa Claus and his reindeer. Winter themed Poppystamps craft die featuring the word "Joy" with a snowflake. 4.6 x 1.8 inches. Christmas themed Memory Box craft die featuring frames with snowflakes. 100% steel craft die from Memory Box. For use on cardstock, felt, and fabric. Cut, stencil, emboss, create. Use in most leading die cut systems. This beautiful angel makes a lovely focal point for Christmas projects. Includes 1 die. 2.9 x 3.8 inches. A pretty snowflake corner that is a terrific accent for all of your holiday projects. Includes 1 die. Size: 2.2 x 3.9 inches. Enter the next dimension in embossing! Our 3-D Textured Impressions Embossing Folders offer the deepest and boldest dimensional embossing experience with a truly striking visual element. Turn ordinary cardstock, paper, metallic foil or vellum into an embossed, textured masterpiece. Sizzix 3-D Textured Impressions Embossing Folders are for use with the BIGkick, Big Shot and Vagabond machines only (used with a single Cutting Pad and the machine's included Platform). For best results, spray fine water mist onto material before use. The Shapeabilities Winter Canopy and Elements Etched Dies Four Seasons by Lene Lok is a set of four dies includes five snowflakes designs, deer and two canopies of winter snow. Immerse yourself in nature's beauty symbolized in texture, elements and design that have been created in the Four Seasons Collection by Lene Lok. Spellbinders Shapeabilities cut, deboss, emboss and stencil with a single etched die template. Approximate Size: Deer: 1.55 x 1.75 in. 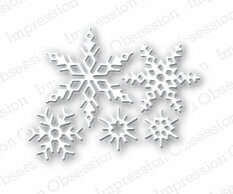 3.90 x 4.40 cm, Snowflakes (5): 1.00 x 1.00 in. 2.50 x 2.50 cm, Small Snow Canopy: 1.70 x 1.80 in. 4.30 x 4.60 cm, Large Snow Canopy: 2.20 x 2.70 in. 5.60 x 6.90 cm. Craft die from Memory Box featuring a snowflake frame. 4.25 x 5.5 inches, 10.8 x 14 centimeters. Craft die from Memory Box featuring an oval frame and snowflakes. 3.6 x 4.8 inches, 9.1 x 12.2 centimeters. 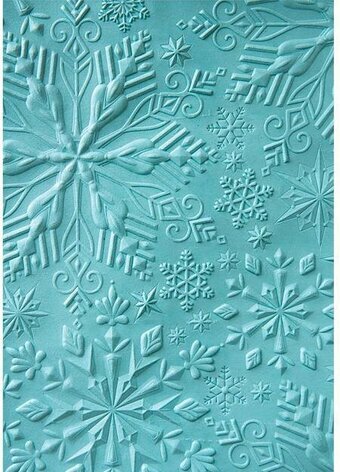 Sue Wilson Embossing Folder - 8 x 8 Snowflake Mosaic. Quality embossing folder that creates a deep and crisp emboss in card stock, paper, vellum, metal, foil and many other surfaces to enliven any craft project. Size: 8" x 8". Snowy Backdrop is perfect for creating a backdrop for your cards! Works great for winter or any time of the year. Lawn Cuts custom craft dies are high-quality steel, made in the USA, and are compatible with most die cutting machines! Approximate die size: [snowy backdrop] 5.5 x 4.25 inches, Made with care in the USA! Add texture and style to your paper and cardstock projects with Darice's embossing folders! Use for scrapbooking, embellishing and much more. These folders fit most embossing machines. Each folder measures 5 3/4 x 4 1/4 inches. Add texture and style to your paper and cardstock projects with Darice's embossing folder! The folder measures 5 3/4 x 4 1/4 inches and will fit most embossing machines. Each package contains one folder. Winter themed Poppystamps craft die featuring a Pinpoint Snowflake Sidekick Frame. 4 x 5.25 inches. Christmas themed Hero Arts craft die featuring a Christmas Ornament with Snowflakes. Hero Arts Fancy Dies are intricate designs and stand-alone cutters that produce beautifully detailed cut-outs on paper. Reminiscent of a Hero Arts stamp design, Fancy Dies compliment stamps instead of matching them to broaden your stamping and technique options. They are made with intricate cutting surfaces from sturdy metal, are universally compatible with cutting machines, and work well with the complete Hero Arts line of stamps and papers. 100% steel craft die from Memory Box. For use on cardstock, felt, and fabric. Cut, stencil, emboss, create. Use in most leading die cut systems. 1.2 to 2.1 inches wide, 1.2 to 2.4 inches tall. 100% steel craft die from Memory Box. For use on cardstock, felt, and fabric. Cut, stencil, emboss, create. Use in most leading die cut systems. 5.7 x 1.2 inches. 100% steel craft die from Memory Box. For use on cardstock, felt, and fabric. Cut, stencil, emboss, create. Use in most leading die cut systems. 2.1 x 2.4 inches. Winter themed Memory Box craft die featuring falling snow. 3 x 2.7 inches. Poppy Stamps craft die featuring snowflakes. 2.1 x 2.4, 1.4 x 1.3, 0.7 x 0.8 inch; 5.3 x 6.1, 3.6 x 3.3, 1.8 x 2 centimeters. Christmas themed Hero Arts craft die featuring a border of Snowflakes. Hero Arts Fancy Dies are intricate designs and stand-alone cutters that produce beautifully detailed cut-outs on paper. Reminiscent of a Hero Arts stamp design, Fancy Dies compliment stamps instead of matching them to broaden your stamping and technique options. They are made with intricate cutting surfaces from sturdy metal, are universally compatible with cutting machines, and work well with the complete Hero Arts line of stamps and papers. The die is 3-1/2" x 4-1/8". These dies are compatible with most tabletop die cut machines. 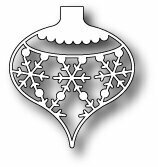 Winter themed Penny Black Craft Die featuring 3 snowflakes. The perfect addition to cards, scrapbook pages and more! This package contains 23 6x6 inch sheets of double-sided Christmas paper. 170 Gr. Joy! Crafts Dies - Christmas charms. 1 piece makes 6 charms. 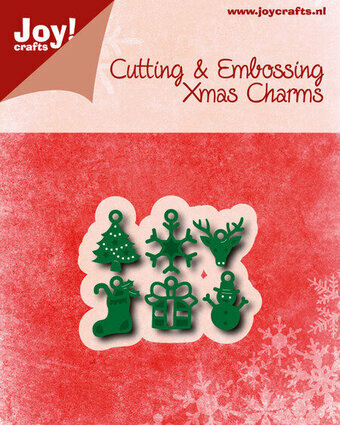 Decorate your holiday projects with Christmas-themed charms. Die makes 6 charms including: Christmas Tree, Snowflake, Reindeer, Stocking, Gift and Snowman. Charms can be hung from a thin ribbon to add flair and dimension to projects. Die size 2" x 1.5". Makes charms approx 1.75' x 1.75'. Christmas and Winter themed 6" x 6" paper pad from Amy Design. 23 sheets, double sided. 170 gr. Christmas themed Memory Box craft die featuring snowflakes. 1.4 x 1.6, 2.2 x 2.5 inches. 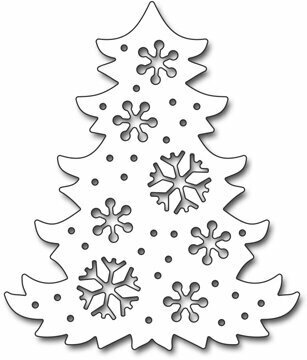 100% steel craft die from Memory Box featuring snowflakes and Christmas trees. For use on cardstock, felt, and fabric. Cut, stencil, emboss, create. Use in most leading die cut systems. 7 dies included. 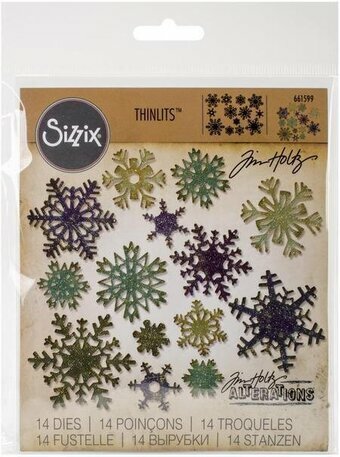 Mini Snowflakes are perfect for making shaker cards, confetti, or other winter crafts. These coordinate with Stitched Snowflakes. Lawn Cuts custom craft dies are high-quality steel, made in the USA, and are compatible with most die cutting machines! Approximate die sizes: [largest snowflakes] 1 x 1 inches, [medium snowflake] 3/4 x 3/4 inches, [small snowflakes] 1/2 x 1/2 inches, [tiny snowflakes] 1/4 x 1/4 inches, Made with care in the USA! Poppystamps craft die Simple Snowflake frame. 2.2 x 3.5 in. The snowflakes range from 1/2" to 1-1/2". These dies are compatible with most tabletop die cut machines. 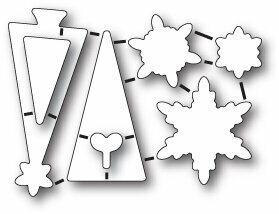 The Snowflake Window Die-namics lets you quickly create an intricate, snowflake-covered look perfect for layering or making shaker cards without contending with any of the fiddly bits common to snowflake die cuts. Cut your design directly into your card front or use the separate rectangle die to trim a panel for layering purposes. 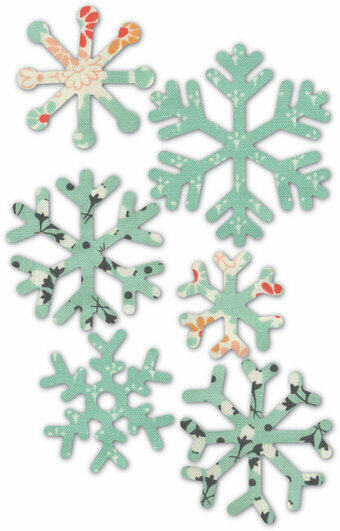 Fluttering flakes epitomize winter weather and Snowflake Window will make your seasonal cards sing. 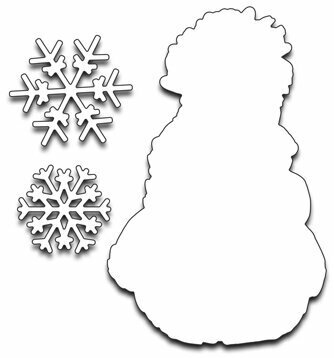 The Snowflake insert measures 2 1/4" x 3 1/2". MFT Die-namics, our very own exclusive American-made line of steel dies. Craft dies featuring the sun, a rainbow, clouds, a raindrop, and a snowflake. Xcut boasts a comprehensive range of designer dies, all of which are made from the highest grade carbonised steel and are tested to deliver a superior cut. Craft Consortium-Decoupage Papers: Blue Snowflakes. Ideal for covering a variety of surfaces and objects including wood, ceramics, plastic, glass, terracotta, MDF, canvases, paper mache shapes and more! Perfect for making Christmas decorations. This package contains three 13-3/4x15-3/4 inch sheets of decoupage paper in one design. Imported. 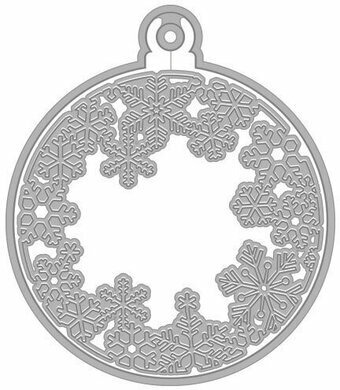 The Snowflake Rounds panel features circular designs with snowflakes, an interesting and appealing background. Try coloring the background with inks or glitter for some added visual appeal. 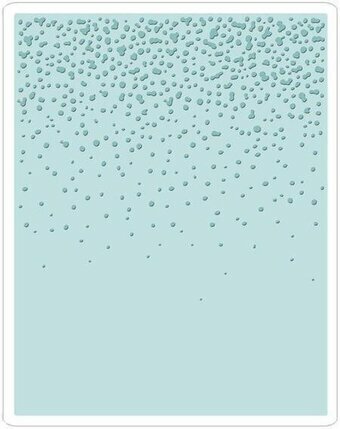 The Background Collection includes panel dies that will design a great patterned background for your cards. The Background Collection is a collection of high quality steel dies designed to coordinate with each other. Designed by Lisa Horton. Includes 2 dies. Size: 4.1 x 5.8 inches. Penny Black Die featuring two snowflakes and a snowman. 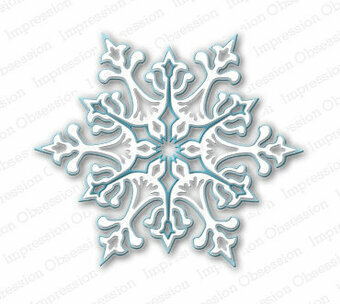 Winter themed embossing folder from Sara Davies featuring a snowflake. Craft die from Memory Box featuring 4 snowflakes. 1.2 x 1.4, 1 x 1.2, 0.9 x 1.1, 0.8 x 0.9 inch; 3 x 3.6, 2.5 x 3, 2.3 x 2.8, 2 x 2.3 centimeters. 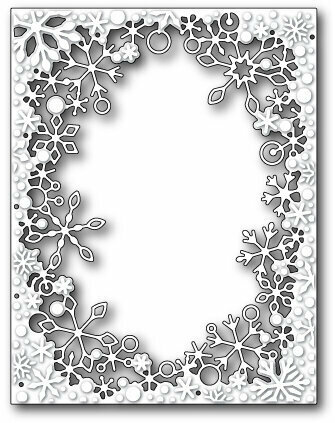 100% steel craft die from Memory Box featuring a snowflake frame. For use on cardstock, felt, and fabric. Cut, stencil, emboss, create. Use in most leading die cut systems.